The "œSidearm of the Samurai" gets a serious update in our Tactical Wakizashi, designed for strenuous outdoor use and protection. This is a modern tactical take on the samurai sword. Handle Length: 8 1/2 in. Also available in the larger Tactical Katana configuration. Not razor sharp, but sharp enough to cut through water filled milk jugs and thin plastic...thicker bottles not so much. Feels good to swing, I can't imagine using it as a defensive blade with a katana in the other hand! Dangerous! This piece really encompasses what i think of as a 'real', useful sword. Weather-resistant components and tough steel. Right off the bat this thing doesn't stay in the sheath, but that was easily fixable using the paracord wrist strap and button, adding a few seconds to the unsheath. This sword has absolutely no frills. It's lightweight, the balance is fantastic, not too blade-centric, it feels like an extension of my arm in either hand. Even stripped down as it is, this sword emenates beauty from its sheer grace and deadliness. Only the tip came razor sharp, but the rest is still sharp enough in a pinch. This will be a mainstay of my survival kit for sure. I just got this today and WOW? Very Impressed. It's the perfect length for someone my height (I'm 5'6"). It's my of quality steel. I love that it's spring steel, it makes it very durable for outdoor use. It came fairly sharp, but I was able to hone it to a razors edge. I've heard some people had problems with the scabbard, mine has a very nice fit and doesn't slide out on its own. Very nice blade of a great price!!! I have yet to test the durability of the weapon against it's sterling review records. One thing that startled me was that it came stating that it was for display use only, I contacted True Swords support and a gentleman called me back to explain that it was a disclaimer from CAS Hanwei to avoid lawsuits from negligent usage. It seems too good to be true, but it appears to be a fine blade, 5160 High Carbon is equal and in some cases superior (especially at this blade length) to 55 hardened 1060 Carbon. My only complaint outside of my original worry is that the scabbard doesn't hold the blade well, which can be dangerous during practical use. I intend to use this in my survival kit, alongside a hawk. That complaint is arguable by the fact that the scabbard is fiber glass and has a drainage hole, so with appropriate measures if you submerge yourself in water with the blade you may avoid serious damage to your weapon. For 99.99 this is a great deal. True Swords has awesome customer service, why wait? This is a decent enough functional sword if you are looking for something shorter than a Katana. I have bought two of these, and though the blade bevels are well ground, the tip is not polished like the rest of the blade. Indeed, on my latest I can still see some shallow grind marks. Also, on both of mine the grinding on the tang area is not too impressive. The habaki (collar) on the latest is not completely closed. That is probably not going to be a problem, but it shows marginal fit and finish and inattention to detail. This is nowhere near as nice as the 1060 Mushashi swords that I have. The full tang and shorter blade helps to give the sword nice balance. 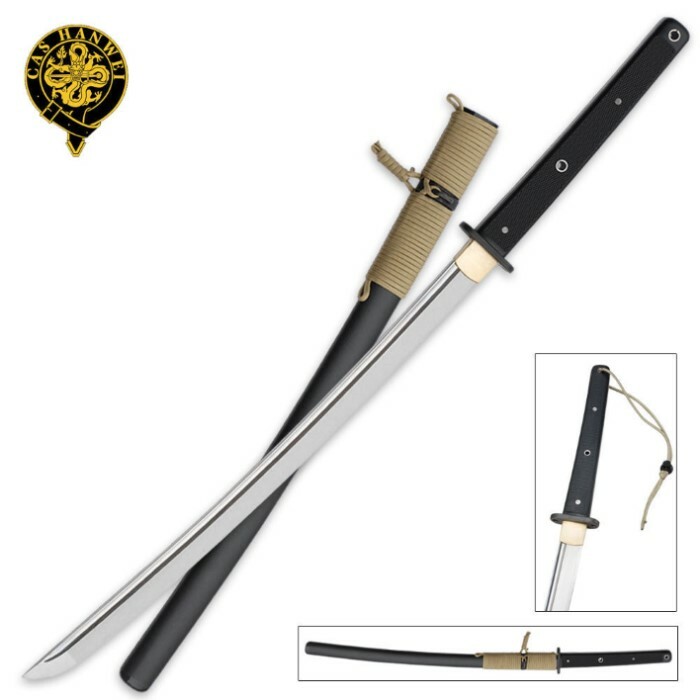 If you are older or have back or other physical problems, then the balance of this sword may be better for you than the blade-forward weight of a traditional katana. Overall impression: A decent battle ready short sword, but not as nice as the Mushashi 1060 series. Received my Wakizashi in short amount of time (This is why I keep coming back,great service!). The sword is much better in hand than in oictures, mine came in quite sharp, not razor sharp but good enough for it's intended purpose, it is a fast handling weapon/tool. There is one thing that surprised me, it is full tang, blade is approx. 1/4 inch thick(a good looking piece of steel & I really like the effect of the coating), but blade is quite flexable not as stiff as my other Katanas, since this is my first Wakizashi, perhaps it is normal? I did some light cutting and it performed flawlessly! It will be part of my bug out pack! I am anxious to see the upcoming Tactical Katana, this will be a must have item! this was a great buy.. great construction.. light weight and razor sharp.. a tru hanwei product..